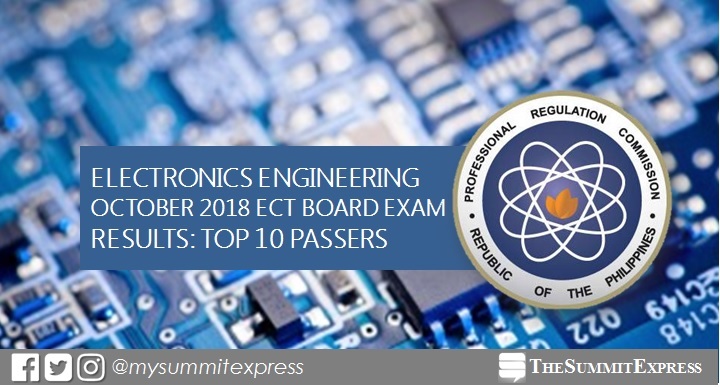 MANILA, Philippines – The full list of topnotchers or top three (3) passers in the Electronics Technician (ECT) board exam is available on this page as officially released on Friday, October 26 or in four (4) working days after the last day of exam. Justine Allen Cayanan Arciga of Holy Angel University (HAU), the second placer in the ECE board exam, also aced the ECT with 95.00%. The Professional Regulation Commission (PRC) and the Board of Electronics Engineering (BEE) conducted the ECT licensure exam in the cities of Manila, Baguio, Cagayan de Oro,Cebu, Davao, Lucena and Tuguegarao on October 22. In the October 2017 ECT board exam, PRC named top two (2) passers with multiple names tied per rank. Technological University of the Philippines (TUP) - Visayas, Ateneo de Naga University (ADNU), Saint Louis University (SLU), Rizal Technological University (RTU) and Malayan Colleges Laguna graduates tied on highest spot with 95.00%. In the October 2016 exams, PRC named the top four (4) placers. University of the East (UE) - Caloocan, De La Salle University (DLSU) - Dasmarinas and TUP-Visayas alum had identical grade of 93.00% for the top spot. Monitor this page for the real-time updates on ECT board exam results. Check out also the official website of PRC (prc.gov.ph) for more information.